( Newton, NC - - July 10, 2010 ) It was a beautiful night to remember a fallen legend and friend in the short track racing community, as cars fielded by family, friends and racing acquaintances hit the track for the 3 rd Annual Dwight Huffman Memorial Race for Charity. The event not only paid tribute to the many accomplishments of the late and great Dwight Huffman, but it supported another one of Dwight's passions in life, helping those in need. Proceeds from the memorial race went to support the East Burke, Eastern Catawba County and South Caldwell Cooperative Christian Ministries, helping thousands in our local community. The 3 rd Annual Dwight Huffman Memorial featured appearances by the Bojangles Late Models in the Arby's 177, the Advance Auto Parts in the RidersWholeSale.com 77 and a 50 lap UCAR Clash for Cash race. 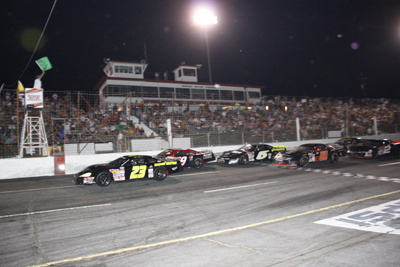 The night also featured the biggest driver payouts in the history of Hickory Motor Speedway, which the No. 32 of Matt McCall could tell you about first hand after taking home with the win and the $7,007 pay check for his win in the Arby's 177 featuring the Bojangles Late Models. The 23 car Bojangles Late Models field hit the track for a memorable 177 lap feature presented by Arby's with the No. 23 of Matt McCall pacing the field. McCall and the No. 21 of Travis Swaim ran side by side for the first two laps until Swaim fell off the pace, allowing McCall to power on. On lap five the No. 5 of Brennan Poole grabbed the lead moving McCall into the second place position. The first caution fell on lap 12 after the No. 66 of Shane Huffman spun after exiting turn four. The second caution quickly followed on lap 14 after the No. 88 of Kyle Mansch went for a spin in turn two. After falling back into the third place spot, McCall wheeled his way back into the second place position by lap 30. McCall decided it was time to move back out front, grabbing the lead from Poole on lap 35. On lap 38 the No. 10 of Andy Mercer shot to the high line and began running side by side with McCall, until he took over the top spot on lap 41. On lap 62 the No. 43 of Jesse LeFevers experienced mechanical issues bringing his car to a crawl in turn two, bringing out the third caution of the race. McCall didn't get quite the restart he was looking for, allowing the No. 2 of Michael Cherry to jump into the second place position pushing McCall back into third. McCall rallied back, regaining the second place spot on lap 64. Caution number four fell on lap 73 after Mansch and the No. 92 of Candace Muzny made contact heading out of turn three sending Muzny for a spin. It wasn't long until McCall was back in the lead, moving around Mercer on lap 74. Things got intense on lap 81 as the No. 5 of Becca Kasten, the No. 29 of Andy Loden and the No. 05 of Jordan McGregor took things three wide coming off turn four. The three cars made contact heading down the front stretch, sending Kasten for a spin straight into the front stretch wall. A seven minute break was held on lap 100 allowing cars to make minor adjustments and change two tires. It didn't take long for a sixth caution to fall after the break as Muzny, Wallace and the No. 3 of Jason Romero connected heading down the front stretch, sending them spinning into the inside wall on lap 102. The red flag was waved to allow the track safety crew time to repair a barrier at the end of the inside pit wall after the wreck. The night didn't turn out as well as the No. 7 of Ashley Huffman, son of Dwight, hoped after he experience mechanical issues on lap 109, bringing his night to an early end. Huffman's misfortune brought out the seventh caution of the race for debris on the track. Poole made a hard charge for the lead, moving back into the position on lap 117. McCall maintained his dominance over the field regaining the spot on lap 119. Mansch was on fire after the break moving into the second place position on lap 122, and into the lead on lap 124. Caution number eight waved on lap 127 after Mercer cut a tire and spun in turn four. The ninth caution fell during the restart after Mercer made contact with the No. 74 of Jared Marks, who missed a gear during the restart, sending Marks spinning into the front stretch wall. A competition caution waved on lap 150, dramatically ending the Arby's 177 with a 27 lap shoot-out. McCall, Mansh and the No. 59 of Coleman Pressley made up the top three as the shoot-out began. On lap 58 Pressley pulled under Mansch beginning a battle for second, a battle that Pressley would win on lap 160. The eleventh and final caution came out on lap 162 for debris on the track. The final restart put Mercer in position to move back into the top three. Mercer spent the last ten laps looking for a way to get around Pressley to take over the second place position, but time ran short as McCall brought the field to the checker flag. 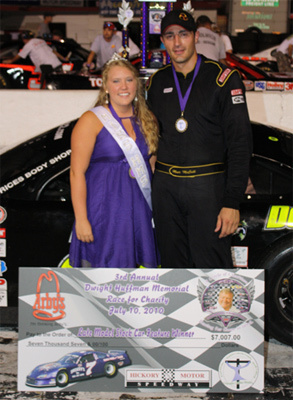 McCall's win made him the first driver to become a repeat winner in the Dwight Huffman Memorial Race for Charity. “This is for Dwight Huffman. It's an honor to be able to run here and run this race,” McCall exclaimed from victory lane. Pressley, Mercer, Poole and Mansch rounded out the top five respectively. The RidersWholeSale.com 77 lap feature for the Advance Auto Parts Limiteds was action packed and caution filled as the 28 car field hit the asphalt to conclude the 3 rd Annual Dwight Huffman Memorial Race for Charity. The No. 5 of pole sitter, Dexter Canipe Jr. was on fire, putting cars a lap down by lap 19. The No. 70 of Noah Triplett went for a spin heading into turn one on lap 24, bringing out the first caution on lap 24. The second caution fell as the field cleared turn three on the restart, after the No. 37 of Landon Huffman went for a spin into the outside wall. Caution number three waved after the No. 28 of Chris Chapman jumped the restart. The third time was the charm to get the race back under green, at least until lap 25 when the No. 14 of Brandon Cox spun out coming off of turn four, bringing out the fourth caution of the race. The No. 11 of Matt Piercy and the No. 31 of Thomas Beane received damage as they tried to avoid the spinning car of Cox. The No. 13 of Dakota Slagle experienced mechanical issues on lap 28, bringing his car to a halt in turn three bringing out caution number five. Beane found himself in the spin cycle in turn two on lap 30 causing the sixth caution. By the mid-point of the race the No. 07 of Tyler Chruch and the No. 35 of Chris Lewis created a tight battle for the fifth place position, until Church pulled ahead on the exit of turn two on lap 40. The seventh caution fell on lap 41 after the No. 23 of Trey Buff sailed into turn one, making contact with the outside wall. The eighth caution was soon to follow after the No. 78 of Gary Ledbetter, Lewis, the No. 2 of Nick Waycaster and the No. 8 of Mark McIntosh collided heading out of turn three, sending Lewis hard into the outside wall. A ninth caution waved on lap 48 for debris on the track. It wasn't the night Piercy was hoping to have. After being involved in an earlier wreck, Piercy found himself going for a spin after the No. 26 of Joey Herques got into his back bumper as the field headed out of turn one. Beane spun his ride around trying to avoid the parked ride of Piercy, bringing out the tenth caution of the event on lap 55. The eleventh and final caution waved on lap 56 after the No. 22 of Brian Murphy and the No. 03 of Russell Stillwell connected heading into turn four. The final laps were clear and free of cautions. The No. 25 of Nick Proffitt had a stellar run moving into the third place spot on lap 64 after starting the race in the 24 th position. Canipe Jr. continued to lead the field around the historic short track through multiple cautions and battles for position, grabbing the checkers in the end. 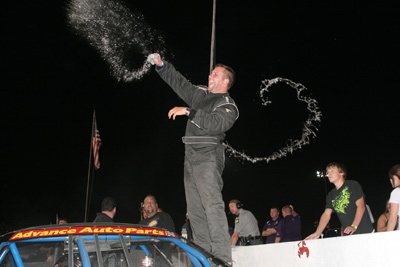 “This is 10 out 12 races we've won tonight, and this one is really special,” Canipe Jr. stated from Victory Lane. Chapman, Porffitt, the No. 12 of Austin McDaniel and Church made up the top five. The UCAR Clash Series kicked the event off with a special 50 lap feature for the 15 car field. The No. 91 of Shane Phillips pulled up on the No. 4 of pole sitter Robert Arch during the first five laps looking for a chance to take over the lead. The No. 9 of Chris Wheeler spent the first 15 laps of the race fighting an ill handling race car falling back to eight from his fourth place starting spot during the first 10 laps. On lap 15 the No. 58 of Kevin Herndon began to battle Phillips and the No. 50 of Rick Watson for his chance to move into the top three. The first and only caution fell on lap 25 after the No. 11 of Michael Neal spun around heading out of turn one. Herndon moved into second during the restart, putting him in prime position to grab the lead on lap 28. On lap 37 the No. 6 of Todd Langdon took over second and set his sights on Herndon for the lead. Herndon brought the field to the checkers, leaving Langdon, The No. 4 of Robert Arch, Phillips and Watson to complete the top five. Saturday, July 17 th is Advance Auto Parts Night at the Races featuring the NASCAR Whelen All-American Series. The event will feature the Advance Auto Parts Limiteds, the Everything Super Trucks, the Hickory Street Stocks, the Red Baron Race Parts Hobby Stocks and a special 100 lap feature for the Bojangles Late Models. Grandstands open at 6 PM, with qualifying immediately following. The weekly On-Track Autograph Session will be replaced with the running of the Hickory Motor Speedway Fan Experience, as the No. 10 of Andy Mercer takes race fans on five full speed laps around the track in a full fledge late model stock car. Racing action begins at 8 PM. Tickets are only $10 for adults, $8 for teens and seniors, $5 for kids ages 7-12, with kids 6 and under FREE. Remember if you not here… you're missing out! 12. (5) Dexter Canipe Jr.